A roller coaster is set up with a track in the form of a perfect cosine. Describe and graph what happens to the kinetic energy of a cart as it goes through the first full period of the track. See the video for the graph. This is College Physics Answers with Shaun Dychko. The roller-coaster is on a cosine curved shaped track so that means the y position of the track follows this equation which is that the amplitude which is the difference between the peak to peak divided by two, multiplied by cosine of the period times x divided by the -- sorry the cosine of two pi times x, divided by the period which is this distance D from peak to peak here, horizontally, plus this amplitude above the ground. There, that's the equation for the y position. 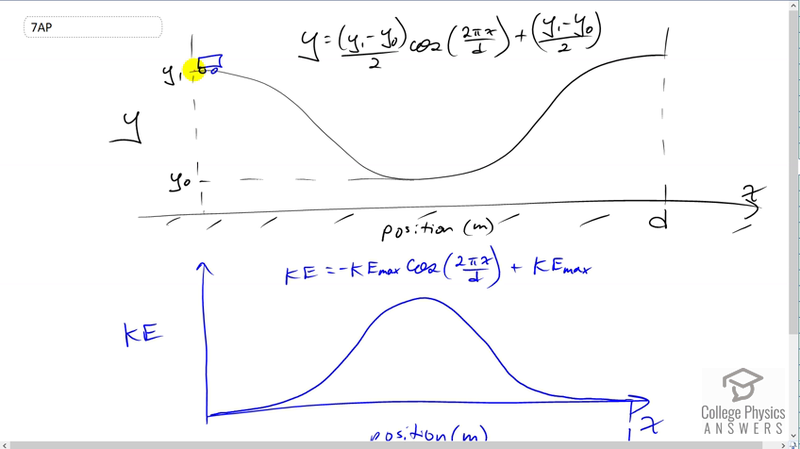 The kinetic energy is going to follow this curve which has zero at the very top and curves upwards to have a peak at the trough of the position graph is going to correspond to the peak in the energy graph because it's going to have its maximum speed there. Then it loses speed gradually till it has zero again at this position d. This graph if you wanted to make an equation would be that kinetic energy is this cosine graph flipped over and then translated upwards an amount equal to the maximum kinetic energy and you have negative K E max, the negative flips it over by the way, cosine of two pi times x position divided by the period d.